Married to a convert herself, Anita Diamant provides advice and information that can transform the act of conversion into an extraordinary journey of self-discovery and spiritual growth. 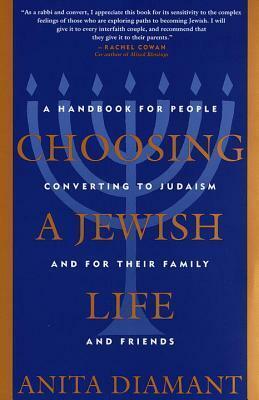 Here you will learn how to choose a rabbi, a synagogue, a denomination, a Hebrew name; how to handle the difficulty of putting aside Christmas; what happens at the mikvah (ritual bath) or at a hatafat dam brit (circumcision ritual for those already circumcised); how to find your footing in a new spiritual family that is not always well prepared to receive you; and how not to lose your bonds to your family of origin. Diamant anticipates all the questions, doubts, and concerns, and provides a comprehensive explanation of the rules and rituals of conversion. ANITA DIAMANT is the best-selling author of The Red Tent and The Boston Girl, among many works of fiction and nonfiction on contemporary Jewish practices. Her nonfiction books include How to Raise a Jewish Child and Saying Kaddish. She is the founding president of Mayyim Hayyim/Living Waters Community Mikveh and the Paula Brody & Family Education Center in Newton, Massachusetts.